A detailed development pattern of the reactor destruction process has not been properly elaborated; however, the following pattern became popular quite soon among all the experts (those of sound mind). The whole accident process is subdivided into several phases. 1) The reactor accumulates high (non-compensated) positive reactivity, which results in rapid growth of power generating capacity. 2) Intensive steam generation and pressure growth in the reactor fuel channels (TC). Due to high positive steam (void) coefficient of reactivity, reactivity input and power growth are further accelerated. 3) In certain particularly heat-stressed TC’s fuel reaches an extremely high temperature (close to, or even exceeding the melting temperature), and fuel assemblies (FA) are destroyed. 4) As the FA’s are destroyed and the fuel contacts the TC walls, the TC itself is destroyed. Steam may now enter the reactor space (RS) (which is considered outer with relation to the channels; dehydration of the channels and reactivity growth are further accelerated. 5) Destruction of a sufficient number of the TC’s (4 would be enough) causes high pressure growth in the RS, which is enough to lift the top wear plate and to destroy the reactor shroud. This process, in its turn, causes (strictly mechanically) mass destruction of the fuel channels and release of steam (under pressure of ~70 A) into open space. All this happens almost instantly; in fact, this is the first (steam) explosion, akin to that of a steam boiler. 6) The whole reactor core is instantly and fully dehydrated, creating a positive reactivity which is much higher already than percentage of delayed neutrons – about 0.7%. 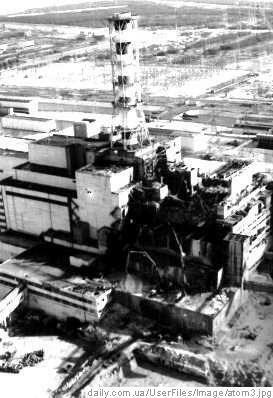 The reactor is accelerated by prompt neutrons, and fully destroyed. This is the second (nuclear) explosion. It’s not an atomic bomb explosion, but it has the same physical nature. There are no events recorded by the DREG and by the CRU instruments that would contradict to the above scenario; and, vice versa, none of the other (more or less comprehensible) alternative scenarios of accident development process fully match all the recorded events. The above scenario also complies with the reactor physical properties. There are two issues that were (or still are even now) the subject of irreconcilable discussions: 1) What was the reason of initial insertion of positive reactivity, and how high was it? 2) When did this positive reactivity insertion start, and how? In fact, the reply to both these questions is quite obvious. The initial positive reactivity that released the accident was inserted by emergency protection rods (the case when brakes accelerate the vehicle), and its maximum value in terms of delayed neutrons was ~0.7%. Indeed, there was no reactor power growth before pushing the EPS-5 button, but three seconds later after that, its capacity made all the instruments go off scale, and the data recorder showed a vertical line.